At Antonio Sotos we love bringing you very varied recipes, and this time we have chosen a very healthy option with a great enhanced flavour, given that we’re going to combine two very different spices, saffron and curry for making a vegetable mix. Would you like to see the result of this recipe? 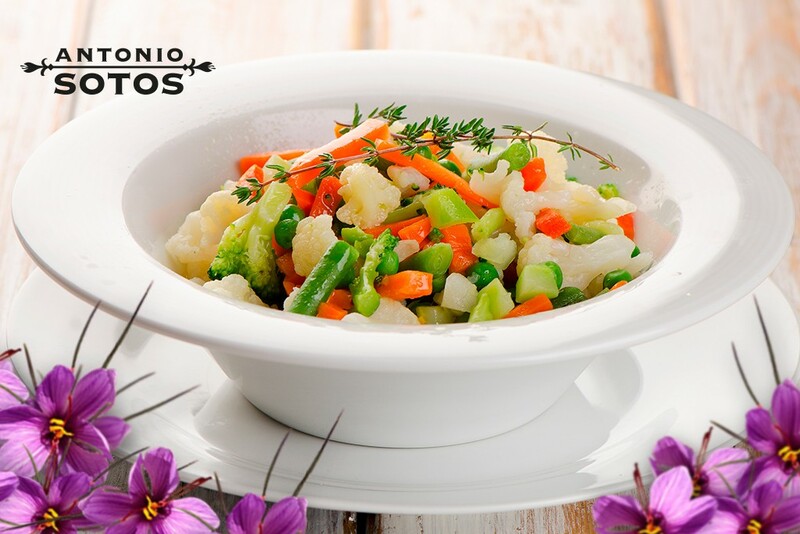 The first thing to do is to prepare the vegetable stir fry, that’s why the vegetables must be washed with water and then the carrots, spring onions, cauliflower and broccoli chopped (chopped into very small florets). Once all the vegetables are prepared, blanch for approximately three or four minutes in slightly salted boiling water. Then drain and rinse the vegetables in cold water. Now it’s the spices’ turn. First sauté the saffron strands with a little oil, and add the curry. Pour the evaporated milk into this mixture and crumble the stock cube so that it is properly blended with the rest of the ingredients. The sauce must thicken slightly, that’s why we leave it to cook and then add a pinch of salt and pepper to taste. Next adding all the vegetables into a large bowl and proceeding to add the raisins, small raisins are preferably better, for example, Corinth raisins. Cut the endives into strips and toss them into the bowl with the vegetables. Toss lemon juice into the entire mixture. Finally, adding that final touch. Pour the sauce which we have been cooking whilst still a little warm and once the vegetable mix is served on dishes, garnish with a sprig of rosemary, imbuing that light touch with the smell that the rosemary gives off. Did you like this recipe? It is ideal to be served as a garnish or even to be eaten as an entrée. Follow us on our Facebook, Instagram and Twitter social networks to be kept up to date with all saffron recipes that we bring every week.